Understanding and visualizing the relationship between critical infrastructure is of vital national security interest to the United States. 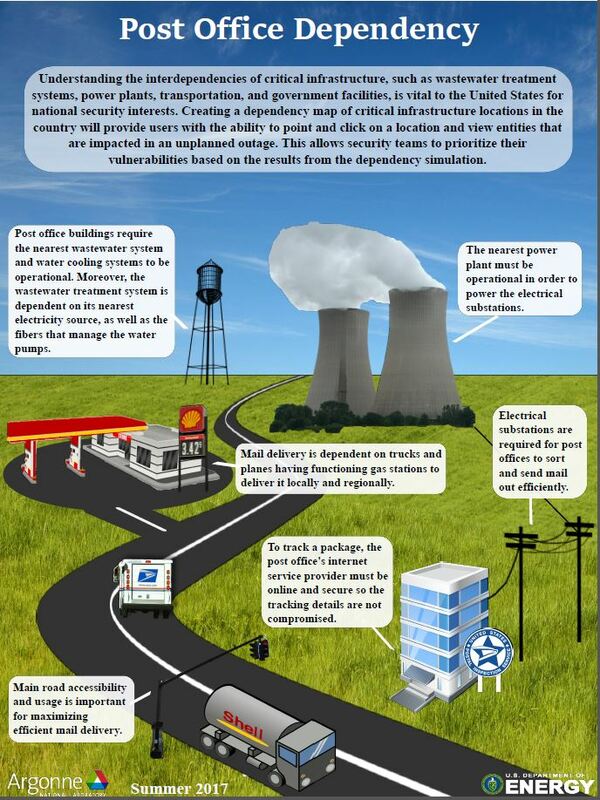 Importantly, because infrastructure is often highly connected and interdependent, being able to simulate failures in the infrastructure and visualizing any consequential failures is invaluable information for setting homeland security priorities. Moreover, given the complexity of infrastructure data, recent development interest has grown around creating visualization tools that can readily and economically render this information such that critical stakeholders can gain insights about the nation’s information in a time-sensitive manner. Critical Infrastructure Layers (CILs) include, but are not limited to, the physical and infrastructure elements that support the day-to-day function of cities, municipalities, townships, states, and regions within the United States. CILs span a wide range of physical elements and services like electrical power plants, electrical carrying lines, water treatment plants, data centers, among others.